Before I begin, allow me to give you a quick geography lesson on the makeup of a rainforest. A rainforest has five layers – the forest floor, the shrub layer, the understory, the canopy and the overstory – but we only need worry about two – the forest floor and the canopy. The forest floor is pretty self-explanatory, consisting of the ground level of the rainforest. Most people who do a rainforest walk will only see this ground level. 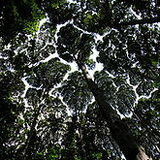 The canopy, meanwhile, refers to the thick layer of trees that block the sky. According to Wikipedia, up to fifty per cent of all plant species exist in the rainforest canopy; while other studies suggest that 70-90 per cent of rainforest life resides in the canopy. This means that when you explore the rainforest floor, you are only seeing a tiny percentage of the life contained within. Okay, you can stop yawning now. The O'Reilly Tree Top Walk is a 180 metre journey through Lamington National Park, in the Gold Coast Hinterland. The walk, the first of its kind in Australia, is made up of nine suspension bridges that are 15 metres from the ground. There are also two observation decks built above the walk way, some 30 metres from the ground. Lamington National Park is a World Heritage protected site that is located on the northern side of the Tweed volcano. The rainforest contains ancient strands of Gondwana rainforest (including Antarctic beeches that are more than 5000 years old), more than 500 waterfalls, endangered tropical orchids and a variety of Australian flora and fauna. Whether you're up high or down below, Lamington National Park is a fascinating and ecologically important slice of Australian nature – but since most of the good stuff exists in the canopy, O'Reilly Tree Top Walk provides the best spot for observation.